So much she hasn't done. Her family and her home? “Wait”, she said. “Don’t forget your backpack!” He smiled and she blew him a kiss as he ran out the door. Then she put away the milk and cereal and cleared the three bowls from the table. She glanced at the clock. If she timed it right she’d be able to drop by Starbucks for a latte, and add a few rows to the sweater she was knitting, before work. It was her only luxury. She sat at the table and took out her knitting. She was working on a sweater for her baby girl. It was several shades of pink, all in one yarn. Variegated they call it. She liked it because it was called “Pretty ‘N’ Pink”, like a movie she’d seen long ago. Pink is Baby Girl’s favorite color. As she added each stitch she thought about how much her life had changed. After she’d married she’d quickly found out there wasn’t a lot to offer in a small town. She’d never really felt welcome there. She was included, at first, because she was new and it was the polite thing to do. After the new wore off the invitations quit coming. She didn’t really mind because she felt uncomfortable anyway. When her oldest was born she’d had some company. He was an early talker and they spent many hours in semi-one-sided conversations. He asked a lot of questions and said things that made her laugh. When number two was born it was a little harder. She was a stay at home mom and money was tight. But things were good and she enjoyed her life. Baby girl was a bit of a surprise. She was welcomed, nevertheless, but it was even harder with three babies. She would have liked to help with money but the daycare alone would have taken her whole paycheck. So she did what she could to make a good home. She’s not quite sure when the lies started. Looking back she wonders if things were always that way and she was too busy to notice. There were sometimes explanations that didn’t make sense, but she was taking care of the kids and the house and didn’t have time to ponder. Slowly she realized things weren’t quite as they seemed. It wasn’t adding up. She tried but it was a one-sided effort. It was too little, too late and he was gone. All her dreams were gone, with him. She looks down to check the tension of her stitches and thinks she needs to leave after she finishes this row. She got a job in a secretarial pool. It’s minimum wage but she was told she could work her way up to another position that might pay more. It keeps food on the table. He sends a check each month. It’s not because he wants to. He has to. He’s doing well with the younger, thinner, better; her replacement. Someone he always said was just a ‘friend’. She counts her blessings. She makes ends meet and tries not to be bitter. And she wonders, as she heads to the office, is there life out there? She's done what she should. Knitayear is on the downside. Just a little over two months more! Day 297, January 22 was my Saturday to work. I don’t mind but it’s hard when I have Friday off. And it messes up the weekend. But I was content to go. My intern is a nice kid and he likes what he’s doing. We went to lunch and he bought. I didn’t want him to but he wouldn’t hear of it. I’ll treat him next time. I chose the blue from the Gap-tastic cowl. I really like that yarn. Day 298, January 23, and I’m sick again. Or maybe I never got over it completely. I think it’s the trip from last week and maybe after I get the cedar out of my system I’ll be okay. I drank Theraflu and it’s my new wonder drug. I didn’t feel nearly as groggy the next day as I do with Nyquil. 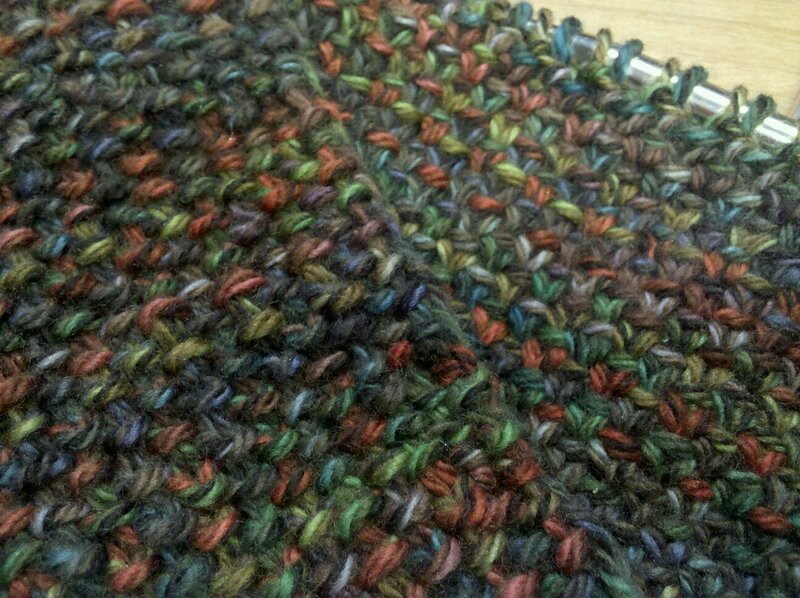 I chose a green fuzzy yarn. It’s because of the cold. But that’s gross so I’ll stop now. Ha ha. January 24, day 299 and Alan is sick now. He was feeling so bad he stayed home. That’s something right there. I worked with the doctors so got home a little earlier than normal. I was in a caring mood. But all Alan wanted to do was sleep so I didn’t do too much! I chose a blue eyelash yarn. Day 300, January 25, is Tuesday and a busy day at work. I was industrious, though and got a lot done. I chose thick maroon yarn for the day. Day 301, January 26, and I’m just tired. I think this cold or whatever it is, hasn’t run its course. I don’t know. Anyway, I picked a thick and thin pink yarn. It kind of symbolized the feeling good on and off. I’m ready to feel better and get some energy back. I know I need it ‘cause I’m pretty sure there is life out there. I just need to find it. Bryce's scarf. 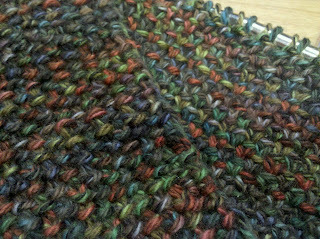 Linen stitch in two yarns. Back and front sides. There's a place in the sun that she's never been. Where life is fair and time is a friend. Wowzer Girl! Your writing really speaks to me. You really are such a talented writer. And knitter. Can't wait to see what else you have hidden in your bag of talents! Great story! You're so good at writing. @Miss Bee...Just never can tell what's going to show up, huh! ha ha Thanks! @Sinéad...Thank you! Glad you stop by.